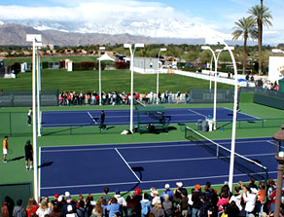 Want to come to the desert, stay at the coolest hotel in Palm Springs, watch 150 or so of the best players in the world up close for 3 days, have a clinic with some of the best writers and coaches from Tennisplayer, and raise your game a level through the incredible power of osmosis? OK you can. The dates are Friday March 9 through Monday March 12. The great players in the big stadium, and up close everywhere else. For the past two years I've written about how the event at Indian Wells is a special opportunity to learn by osmosis from the top players in the world. First of all it's virtually all of the best players, men's and women's. But second, and more importantly, in the first few days of the tournament, the secondary stadiums, the outer courts, and the practice courts are configured in a way that let's you get up close to them--I mean front row in many cases. Click on photo to see and hear what the Osmosis Clinic will really be like. And if you watch the best players from point blank range, it's impossible not to absorb some of their great tennis directly into your system--especially if you know what to look for. So we'll start the clinic with a dinner and a special high speed presentation showing you exactly what to watch for and how to internalize it and make it your own. And we'll supplement that process with some structured on court training with some of our best writers and instructors to help you feel the key pro positions. We also plan to have measurably levels of fun. If you want to get the feeling of what I have in mind, click on the special music video to the left. The whole event has to start with the right hotel. 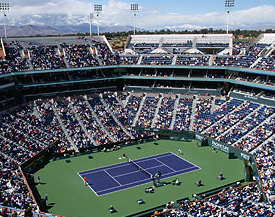 During the tournament the big resorts around Indian Wells are packed. In fact, they are already mostly sold out for the 2007 event. There are some great spots, like the Renaissance Esmerelda, the Champions Grand Hyatt, and La Qunita Resort. I've stayed at them all, and they are all amazing in different ways. During the tournament the rooms start at $400 or higher a night. 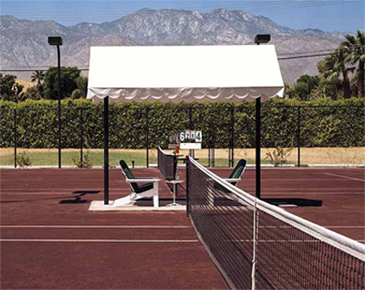 It's also difficult or impossible to get out on the courts at these hotels during the event. 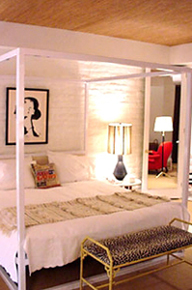 Glimpses of the Parker Palm Springs: a hotel for celebrities on the down low. Believe it or not it used to be Gene Autry's house. And you can still see some of his bizarre old time Hollywood cowboy paraphernalia (if that works for you). But now the Parker is a place where celebrities go on the down low. Allegedly, it's where Brad Pitt impregnated Angelina Jolie. It's got a wonderful, whimsical nouveau deco design theme, an incredible series of gardens, gorgeous pools, and the whole big time spa thing. I plan on getting a facial myself while I'm there. Cool rooms and 4 perfect pristine red clay courts--2 with lights. But more to the point of our trip, it has 4 gorgeous, perfect red clay courts under the direction of my friend Tory Fretz, an elite player from the early glory years of women's pro tennis. Ask her when you meet her, by the way, what Chris Evert was really like in the locker room. So here is the plan. You fly into Palm Springs--or one of the other airports that are within driving distance, Ontario, or even LAX. You get yourself out to the Parker Palm Springs on Friday March 9. We'll have an introductory group dinner, with a couple of glasses of nice wine. Then after dinner I'll give the presentation on how to make osmosis happen big time when you watch the pros. I'll explain how, if you know what you are doing, it can lead to a quantum jump in your game. I'll be showing you some incredible high speed footage on the big screen of the players you are likely to see up close, and what to look for on all the strokes. We'll break it down to a few simple, powerful, key images and positions. It similar to the kinds of talks I do for teaching pros at conventions all around the country. The idea is to give you a new perspective and some learning tools that you can apply not only at Inidian Wells, but wherever you go and get the chance to watch high level tennis. There'll also be time for some questions and answers and some after dinner small talk both including some of our other Tennisplayer writers and teachers. The Osmosis lecture: what to watch and how to absorb it into your game. Then Saturday morning you'll hit the courts yourself. There will be 3 rounds of 90 minute clinics starting at the crack of dawn, 7am for you east coasters. The second round is at 8:30am, and the third is at 10am. Basically it'll be 4 people on a court for 90 minutes with some of the best teaching pros in the world. Tentatively, we have Scott Murphy, A.J. Chabria, Dave Hagler, and Giancarlo Andreani on board. Each court will be devoted to working on pro positions for one or two strokes that you learned about in the video lecture the night before. Then when the clinic is done, you're off to the event with the mind of a human tennis sponge--knowing exactly what you are going see and try to absorb. Saturday, Sunday, and Monday--the 3 days of our clinic--are the biggest three days of the tournament in terms of the number of players. There will be literally dozens of great potential matches. We'll give you a ticket to the big stadium that also functions as a grounds pass, and instructions about other ticket options for the reserved seats for the second and third stadiums that will virtually guarantee you a front row seat. We'll also give you a night ticket for the stadium, and there will be matches well into the evening on the outer courts as well. You can hang out with some of our teaching pros and watch the matches because that's where they will be. And if you interested you'll can see how we do the filming for Tennisplayer. Maybe you'll run into Roger hanging out by the courts. Now one key fact is this: the Parker Palm Springs is not next door to the stadium. It's about 30 minutes down the road. That's what makes it possible for us to get our package deal and the run of the facilities. So you'll need a car or a ride. You'll also want transportation for dinner if you want to get out to some of the world's best steakhouses, as well as some other interesting hang outs we've discovered over the years, because they are all scattered up and down the valley. I think we can also probably work it out among our group to share the costs if some people want to go in on car rentals. You'll have to juggle the steak house option with the night tennis option. But if you stay at the tournament, there is plenty of food there. If you're like me, you'll play it by ear depending on who you've seen, how much you've seen, and who is left to see. I think our three days are the best three days of the whole tournament, because virtually every player in the draw will play at least once. But when and on what court is something you never know until the event releases the schedule, usually around 9pm the night before. On Day 2, Sunday, basically we'll do the whole thing all again. The morning clinic, the day ticket, the evening ticket, and/or the suggestions on restaurants in the evening. 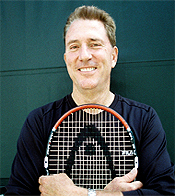 If you are a real maniac you can also get out on those red clay courts as much as you want. Two of them are lit. Just know going in, your shoes and your socks are going to be pink for the duration of their existence. That is status in the tennis world, because it shows that, yes, you have played on red clay. Instruction from some of the best writers and coaches in the world. On Monday, you get up, check out, put your stuff in valet storage at the hotel, and head out to the site in the morning for as long as you like--just remember to get to the airport in time to get back home. And if by chance you do want to stay a day or two more--or to come in early to do the same--we can work that out as well, including some possible private instruction with one of our awesome Tennisplayer instructors. So what's the nut? You're on your own for the airfare. The Parker Palm Springs is $285 per night (plus tax) and there is a $30/day resort fee per day for use of the courts, pools, etc. If you can find someone to share the room that's up to you. The welcome dinner (including some decent wine) plus my osmosis video lecture is $195. The two day clinic is another $195. And your tickets for 3 days and two nights are a total of $190. To help us conduct this experiment, i've hired a new Director of Events and Promotions, Delyse Pretorius. She'll be in charge of interfacing with everyone on the logistics for the event. Delyse is a native South African, a former college player, and now in addition to working for Tennisplayer, a San Francisco teaching pro. To sign up for the clinic, or if you have questions, you can email her: dpretorius@tennisplayer.net. Once we have confirmed interest from enough people, we'll do a contract with the hotel, and Delyse will get back in touch about the details for the timing of your deposit, full payment, and all the other arrangements. You won't have to actually pay until we get everything set. So let see what happens. I'm looking forward to seeing what kind of impact it can have for our subscribers.